Congratulations are ado to the UBC Library’s Innovative Dissemination of Research Award for 2013 winner, Rowan B. Cockett – a Masters of Science student in Geophysics – who was formally recognized at a UBC research awards reception on March 25, 2013. Cockett’s submission “came from a desire to improve the way geoscience research is disseminated to undergraduate students. It involves an interactive, web-based application designed to enhance the visualization of geologic structures and processes through the use of interactive 3D diagrams”. Read what other accolades Cockett has received for this innovative undergraduate research tool aptly named Visible Geology at: http://about.library.ubc.ca/2013/03/27/geophysics-student-wins-research-dissemination-award/. 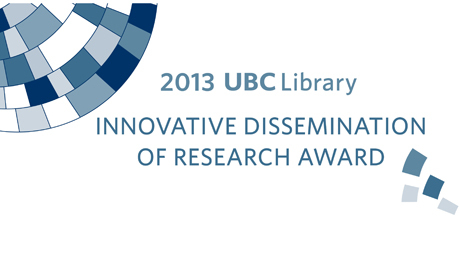 UBC Library’s Innovative Dissemination of Research Award was established by the Library in 2010. This Award honors UBC faculty, staff and students who are expanding the boundaries of research through the creative use of new tools and technologies that enhance the research findings being disseminated. Visit the Scholarly Communications @ UBC website for more details at: http://scholcomm.ubc.ca/award/.